I shared the code yesterday for this projector and it is still working (GDXR23R6). Click on the get deal button the lightning deal gives you 15% off, if you are lucky 10% voucher will also be there which gives you further 10% off also apply the following code at checkout GDXR23R6 and you get 20% off further. I posted the code yesterday and at that time it took it down to £62. I have used this projector so this is an absolute bargain. 【REMARKABLE BRIGHTNESS AND CLARITY】GC555 is Powered by Advanced Optical System and Engine. 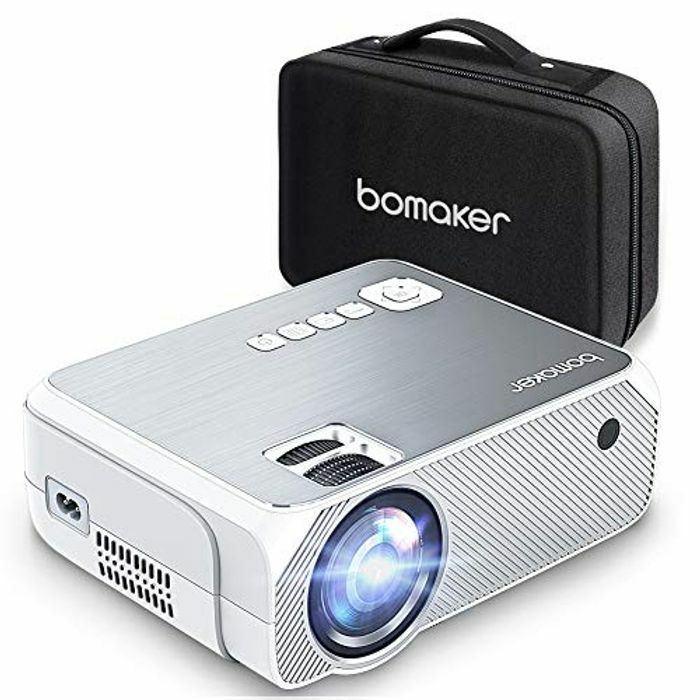 2019 upgraded LED Optical System enhanced +50% brightness and +30% clarity than ordinary 720p projector.Supporting 1920x1080 resolution, 2000:1 contrast ratio provides sharp picture and vivid colors. 【PREMIUME HOME THEATER】68" "TV" for under 100 quid. Watching movies using a projector on a 35"~250" screen instead of looking for a expensive TV to mount is brilliant. A throw distance of about 2 meters with 68"is the recommended distance, which give an amazing picture quality and contrast. 【ULTIMATED AUDIOVISIUAL EXPERIENCE】 GC555 creates 2x higher sharp and distortion-free image with Native 1080x720p resolution, Setting up with a 100 inch pull up screen and ABOX 120W sound bar(B07D5XQ61J) is recommended to create the premium home theater. 【3-YEAR MANUFACTURER WARRANTY】 BOMAKER offers our customer a 3-year 100% Money Back Guarantee and professional customer service.If you have any problems,please feel free to contact our professional 24/7 customer service at Support@bomaker.com.